Note: National Dog Week is coming up: September 18-24. If you own a backyard pool and a dog, one of the most important things you can do for your pet’s safety is teaching him how to swim. Helping your dog learn this skill and to exit the water will help protect him. Toward that goal, make the instruction process as fun and gentle as possible for your four-legged friend. What dog owners sometimes overlook is some planning steps before actually attempting to lead a pet into the pool. Some dogs will need a series of lessons in order to get the knack of swimming and feel safe in the water. So with that in mind, a little preparation can go a long way toward making your teaching experience a success. There are a number of factors to consider before you begin the training process. They are especially important if your pet appears to be shy of the water. Here are some points to consider so everything is in place to introduce your pooch to the pool. Evaluate your dog’s natural ability to swim. Dogs have a reputation for being natural born swimmers. However, never assume your pet can swim on his own or even develop the skill. In fact, the ability to take to the water depends largely on the breed. Some, such as poodles, Irish and English Setters, and many varieties of retrievers, generally do very well in an aquatic environment. Any breed with the name “water” in it—like a Water Spaniel or Portuguese Water Dog—is a good bet. A number of breeds were originally bred for the water. The reason was practical: Hunters (and fisherman) wanted animals who could enter lakes, streams, rivers, and other bodies of water to help retrieve fish, waterfowl, and other small animals. As a result, these breeds typically enjoy water and make excellent swimmers. Other breeds may have less inherent talent, but they are comfortable in the water and can learn to swim. However, there are a few breeds, such as bulldogs, boxers, and dachshunds, where water and canine don’t mix well. Although their sturdy builds serve them well on land, their short legs, and thick bodies make it difficult when it comes to moving in water. However, some can master swimming, at least well enough that they could get out of the pool should they fall in. Most toy breeds like Chows and Pomeranians also fare poorly in the water. So do some larger breeds, such as Greyhounds, Doberman Pinchers, and Siberian Huskies. Then, there are breeds with other aquatic-challenging traits. For example, Maltese and Chihuahuas can usually learn to swim, but they tend to easily catch chills, especially in cold water. This drop in body temperature can cause them to become easily fatigued—putting them at risk of drowning. If you are unsure about your pet’s inherent compatibility with water, check with your veterinarian, or perform an internet search for your dog’s specific breed and hereditary capacity for swimming. Remember, despite genetics, there are always exceptions for individual animals who happen to love or loathe the water. 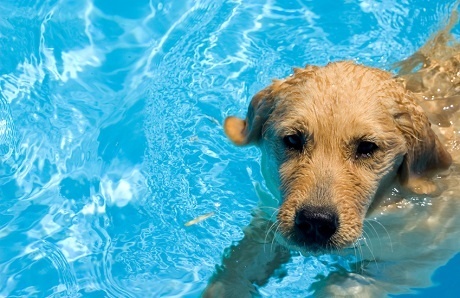 If your dog isn’t a swimming breed—or just is not a fan of the pool—read our blog article “How to Keep Your Dog Safe In and Around Your Swimming Pool” for practical tips on helping safeguard your beloved pet around the pool. Start the process early on. If you happen to have a puppy or young dog, it’s smart to begin acclimating them to water early on. That does not mean teaching them to actually swim; it means helping them get used to being in water incrementally over time. You can fill a bathtub with just an inch or so, set him into the tub to get his paws wet. As he grows, add a little more water each time. Another approach is to use an inexpensive plastic baby pool for a young pup to play in shallow water. The beauty of this strategy is that it addresses of a possible concern ahead of time: By the time he’s big enough to learn to paddle, he will already be comfortable being in water. With fear of water basically out of the way, you can focus your pet on learning to paddle. Part of preparation is having the right frame of mind: Patience will be critical! You want your pet’s first encounter with water to be a good one. Pressing him to swim before he’s ready will only create unwanted stress for you and your pet. Promise yourself to maintain a relaxed attitude throughout the training process, regardless of how long it takes. Some dogs take to the water immediately or within minutes. 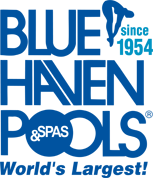 For others, even getting comfortable standing in a few inches of water—let alone swimming—will require multiple swim school sessions. Be prepared to provide training over a series of short lessons that occur over several days. Regardless of the breed, never throw your dog into the pool and expect him to automatically swim! Doing so could traumatize your pet and create a lasting fear of the water. Some owners can manage to encourage their dogs to enter the water while they remain on dry land. 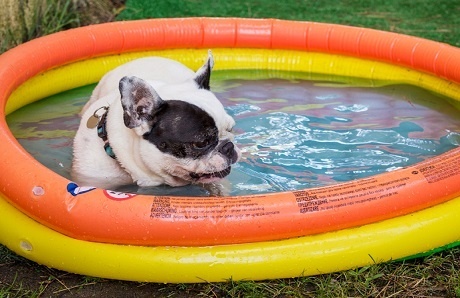 You may be able to coax your pup in—particularly if he is naturally inclined to like water—while you’re standing outside the pool. But don’t count on it. If you expect that your pooch may need more intensive support, plan on joining him in the pool. Put on that swimsuit. It’s time for full commitment. 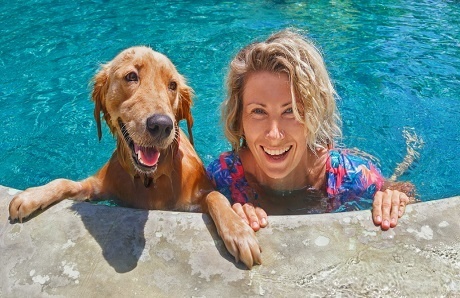 Keep in mind: With only your swimsuit on, you may end up in close contact with your pooch in the pool. So, instead of having your bare skin rub against wet fur and paws, you may want to put on a long-sleeve T-shirt as well. Set the stage for a calm learning environment. It also helps to work with your pet when it’s quiet by the pool—without noise and other people around who could easily distract your pup. Advise family members not to disturb you when doggie swim school is in session. Although a relaxed, distraction-free setting is a good move, there’s one major exception to this approach. If you happen to have another dog who already enjoys swimming, you can use him. Having the strong swimmer around can make it fun for the new student and help lure him into the pool to join his friend! Plan for your pet’s safety. Lastly, be vigilant about safeguarding your dog. When teaching him to swim, continuously maintain a watchful eye over him. Never leave your dog alone by the pool. Some dogs need “training wheels” while adjusting to the water. Consider a doggie life vest. Designed specifically for canines, these devices provide full-body flotation while dogs become more adept in the water. Available in wide ranges of sizes and styles, many of these vests come with a grab handle on top. Like a carrying strap, the handle helps you partially lift up your animal from the water. 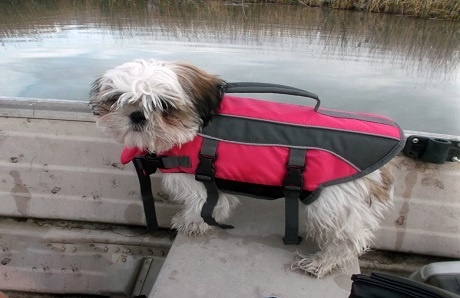 This feature can make a flotation vest particularly helpful for a small person who wants extra help while they support a large dog in the water. Now that you understand how to plan and prepare for your pet’s training session, you’re ready to embark on the instruction process of teaching your dog to swim. There are plenty of online articles and videos that explain—and illustrate—the actual training process step by step. These can help you understand the sequence and techniques to use for training day. Remember: Slow and easy is always the best approach. Make it fun while focusing on safety first. And be sure to give your furry friend plenty of strokes to reward the desired behaviors.